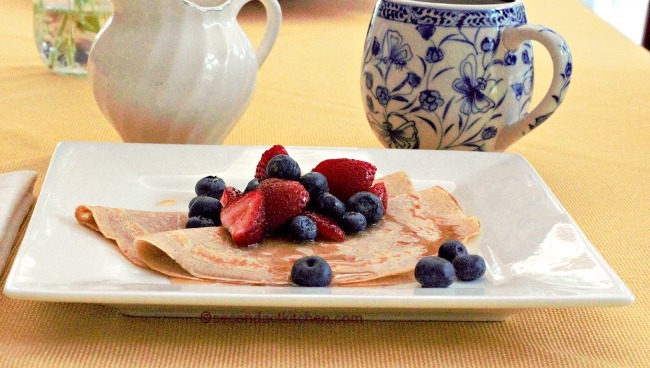 I don’t know about you, but there are some mornings when you want something a little different for breakfast such as whole wheat crepes with fresh berries. This is something easy to make, but nutritious. It’s something special, but does not involve cooked eggs, cold cereal, yogurt, oatmeal or muffins. Not that I don’t enjoy all of those foods, but sometimes you want something more. These crepes are a healthier version than traditional crepes, and they are fun to eat as you imagine yourself in a sidewalk cafe on the banks of the Seine in Paris. If you are a little unconventional or a confirmed vegetarian or vegan, you might go with a vegetable soup or salad for breakfast. For example, a traditional breakfast in Japan includes steamed rice, miso soup, grilled fish, vegetables and Japanese pickles. It takes a little getting used to, but a Japanese breakfast packs a lot of nutritious food into a low sugar start to your day. If a Japanese style breakfast is not for you, and you are seeking a more conventional choice, think about making these homemade whole wheat crepes. To boost the protein, try adding a tablespoon of nonfat cottage cheese or lowfat ricotta as a filling in each of your finished crepes. This brings the protein up to 11 g per two crepe serving. Adding a 4 oz. glass of nonfat milk and a tablespoon of walnuts will provide another 6 g of protein. This will bring the total protein for the dish up to 17 g.
Why is protein important? It helps build cells, tissues and muscles throughout your body and helps your immune system. Protein helps keep your bones healthy as shown in many research-based studies (along with calcium and vitamin D). However, it’s important to not overdo it with protein. The recommended daily amount for protein is 46g for females age 14 to 51+, 52g for males age 14 to 18, and 56g for males age 19 to 51+ (US Dietary Guidelines, 2015). If you are pregnant or breastfeeding, have certain medical conditions or are very active, your protein need may vary from these recommendations. If you have a question about how much protein makes sense for you, consult a Registered Dietitian Nutritionist for help. Place all ingredients in food processor and mix well. Spray 8" skillet or crepe pan with canola oil and preheat on stove. Using a 1 to 1-1/2 ounce scoop or measuring spoon to drop batter into pan and allow it to spread to fill the pan and cook. After 2-3 minutes, flip gently to cook the other side. Remove from pan and hold crepes in gently warm oven until ready to serve. Serve with fresh berries or your favorite fruit. You can also use maple syrup or other condiments as desired. To freeze: Allow finished crepes to cool completely. Place in stack separated by squares of parchment paper. Place entire stack in freezer bag, remove as much air as possible, label and freeze. To use a frozen crepe, remove from freezer, place on microwave safe dish and microwave on high for 15-20 seconds. Nutrition information per serving (2 plain crepes): 170 calories; 8 grams fat; 1.5 grams saturated fat; 0 grams transfat; 115 mg cholesterol; 260 mg sodium; 17 grams carbohydrate; 2 gram dietary fiber; 8 grams protein (values are approximate).